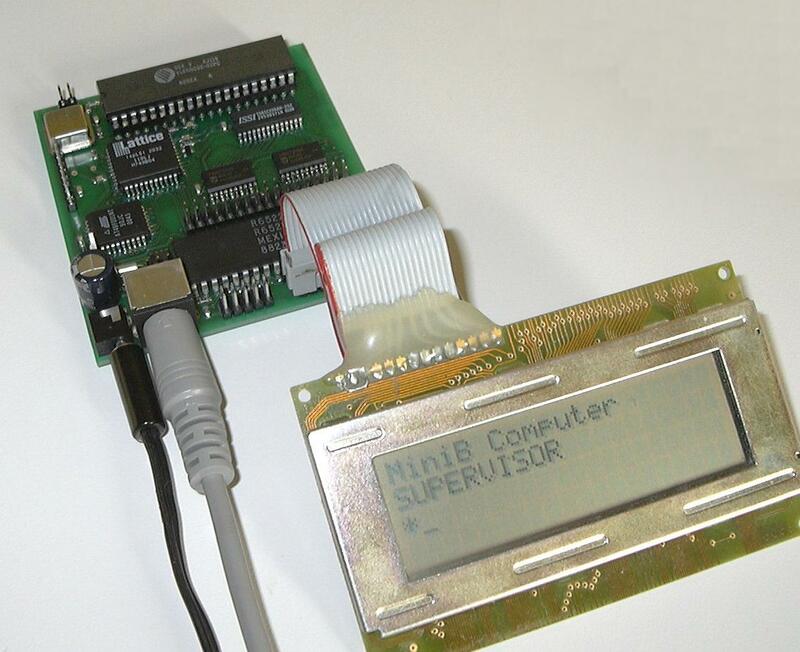 The MiniB is a complete 6502 based microcomputer, measuring just 3.5"x3.1", with all the resources on board to implement a compact controller finding applications in burglar alarm systems/embedded control/and other such places. Where possible it has been designed with more modern, easy to obtain, surface mount components offering not only considerable space savings but cost savings too. Architecturally the microcomputer is based heavily on the BBC Microcomputer series, and indeed a lot of software which will run on a BBC micro will also run on MiniB - including the original unmodified BASIC language. All system control logic is implemented in a single 32 macroblock programmable logic device from Lattice Semiconductor. 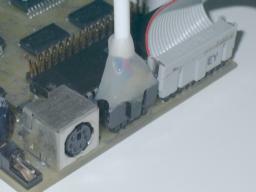 To support the MiniB project there is an operating system for the board. This provides a BBC micro compatible interface to the hardware as well as all of the support required for filing systems and other applications software such as programming languages. The flash ROM which is not used for the operating system appears as 7 'sideways' ROM slots which can include filing systems, languages, and ROM filing system format ROM images. The original BBC BASIC ROM works without modification on the board, though to make use of it you must own one of the original physical ROMs from which the required binary can be extracted. Can the MiniB OS be upgraded after the board is built? Yes, the flash ROM can be programmed in circuit either by using a simple programming header from another BBC micro, or the MiniB can reprogram itself with the built in command SRWRITE. Which PS/2 keyboards will work with MiniB? Any keyboard which supports 'Type 2' keycodes. This is the vast majority of keyboards available, plus any keys which don't appear in the keymapping will be ignored (for example, the 'Windows start menu' key). For more custom applications the keyboard need not be a full 104 key matrix, for example a simple PIC and keypad can be combined to produce a PS/2 numeric keyboard for applications such as electronic key locks. As it doesn't come with BASIC installed, how do I run BASIC programs? For the MiniB OS to start there must be at least one language ROM installed. In a normal BBC Micro this will be BASIC, but this is not supplied due to copyright restrictions - instead to get you started there is a simple language ROM which just starts a command prompt. Once at the command prompt you can reflash a sideways ROM with your own copy of BASIC using the built in flash tools. Tube second processors There is no hardware to support second processors, though requests asking whether the Tube is present will return the correct response. Filing systems All of the filing system vectors are present, all that is required is for a filing system which communicates with its hardware over the 1MHz bus. For example, the 8Mbyte RAM disc and RAMFS or IDE harddisc interface are ideally suited. The ROM filing system comes as standard. Boards are supplied ready programmed so no special cables or extra software are needed. However, MiniB OS has a built in command (*UPLOAD) which activates the VIA port lines and receives serial data in RAM starting from address &3000 until the Escape key is pressed, and is used in conjunction with a download cable and a PC. for example to reprogram ROM number 9.
as detailed in the memory map document the OS is aliased in ROM 15 - which is why the ROM id in the above example is F.
The built in *UPLOAD command makes the MiniB sit and poll the 10 pin header connected to the spare pins of VIA port A. The protocol is very simple: a single data bit is clocked with nSTROBE and the host PC will then poll until the MiniB acknowledges by dropping the nACKNOWLEDGE line on the printer port. Due to using the VIA port A lines are being used a bit like a serial port with handshaking the datarate is lower than that which could be achieved if the true 8 bit parallel port was used, unfortunately that would mean losing the LCD display! Fortunately as the typical size of the flash images are quite small the fact that the datarate is only around 530 bytes/s doesn't impose excessive inconvenience - a 16k ROM takes just over half a minute. The lead is easy to build as it uses only 3 conductors plus ground. The upload software is supplied for the PC along with a tokenised BASIC program on which versions for other hosts can be based. Under Windows 2000 and Windows XP the parallel port registers are protected and will need to be made accessible using the free program 'Userport' by Tomas Franzon, or equivalent. Orders can be placed online, or alternatively sent by post.